Farmer’s market fresh! One thing about summertime trips to the market is that (in the words of my grandfather), your eyes can be bigger than your belly. That’s sort of what happened with the basket of fresh peaches we picked up on Tuesday. To be more specific, it was our capacity to consume them before they hit their tipping point. We’re surrounded by overripe fruit, and so there are peaches in every meal. To top it off, we had a surfeit of cheese, left with us by some departing guests. What to do? When I have a host of items that need to be used, one of my first thoughts is always salad. It’s a go-to when vegetables are in season. This one started with a vinaigrette of homemade red wine vinegar, canola oil, and Kozlik’s Balsamic Fig and Date mustard – in equal proportions. I mixed this in a large bowl, and then began adding veg – greens from the balcony garden, cucumbers, radish, and celery – but use whatever you have, like in this Kitchen Sink Salad. Then I topped it off with some walnuts, sliced peaches, and crumbled Stilton. If you’re a vegan, omit the cheese or use some chopped smoked tofu instead. Even though I bought too many, I never get tired of too many peaches. We love them, and all the other seasonal bounty, so I’m grateful to be able to have many delicious ideas to use them up. As the cold weather dissipates and we don’t just move to a different choice set of produce, but preparation tends to change, as well. If you’re inspired to move away from creamy soups and hearty stews, but there’s still a mix of winter and spring produce available, this may fit the bill. Layer a handful of arugula, a handful of sliced cabbage, 1/4 of an English cucumber, and 1/2 an apple, sliced, on a plate. Drizzle with a mix of 10ml grainy Mustard, 10ml vinegar, and 10ml olive oil (Or use half Dijon/half Kozlik’s Triple Crunch, for the mustard as we did). Crumble an ounce of Gorgonzola or smoked tofu on top. Enjoy! Author WalkEatLivePosted on March 9, 2016 Categories cheese, Gratitude, Healthy Eating, local, lunch, Recipes, Salad, vegetables, VegetarianTags cabbage, Canada, Gorgonzola, mild weather, Produce, salad, seasonal, springLeave a comment on It's Crunch Time! This weekend we were treated to above-normal temperatures, and found an abundance of locally-grown greenhouse greens at the market. It put us in a salad sort of mood. While some ingredients aren’t local, we have tried to strike a balance. Author WalkEatLivePosted on February 29, 2016 Categories cheese, Cooking, Food in a Hurry, Healthy Eating, Herbs, lunch, Recipes, Salad, vegetables, VegetarianTags Canada, Dijon, farmer's market, goat cheese, lemon, saladLeave a comment on Tangy and Tasty…For Two! Call them what you will, one of the best ways to stretch your grocery bill is to incorporate leftovers or things that need using up into your lunch. We’re off to run a couple of errands before the Super Bowl and we were smart enough not to eat the two extra lamb chops in the grocery store package (on sale last week and held in the freezer). We broiled the lot last night and sliced the leftovers for lunch. They’re served on a bed of local baby greens and cukes, both hothouse-grown. Author WalkEatLivePosted on February 7, 2016 Categories cheese, Cooking, Dairy, Food in a Hurry, Gratitude, Healthy Eating, Herbs, lamb, Recipes, Salad, Uncategorized, vegetablesTags easy, feta, lamb, leftovers, local, Ontario, salad, SuperbowlLeave a comment on Lunchovers? One of the most fun things about eating healthily is trying new and unusual fruits and vegetables. Yesterday we were shopping and spotted a granadilla, a semi-tropical, round, orange, shiny fruit. But what to do with it? We made a use-it-up fruit salad that included a banana, chopped pear, chopped apple, a few walnuts (cleaning up the pantry) and a cup of fat-free plain yogurt. The fruit provided the sweetness. Spooning this mixture into bowls after stirring so the yogurt coated everything, we cut into the mystery fruit and scooped its seedy interior on top. The insides are reminiscent of passion fruit or pomegranate, with crunchy, gel-encased seeds. It makes a berry-ish, crunchy-sweet topping and a delicious way to start the day. Was it worth a buck-ninety-nine? As an everyday addition to the grocery budget, perhaps not, but layering that with the fun factor of discovering a new taste, I’d say it was great value. This morning we were just getting back from our walk when our neighbour, Nick, came around the corner. Nick is a lovely Italian man who likes to garden. His little city plot is a veritable Garden of Eden, and even those of us with urban farms of our own look forward to his gifts throughout the season. Whisk together a tablespoon each of wine vinegar and olive oil, a teaspoon of anchovy paste, and a crushed clove of garlic. On top, a sprinkling of Grana Padano and some oven-baked pumpernickel and multigrain croutons. Author WalkEatLivePosted on June 27, 2012 Categories Cooking, Gratitude, Healthy Eating, Recipes, Salad, Slow Food, vegetablesTags Caesar, fresh food, Healthy lunch ideas, menu planning, Neighbours, saladLeave a comment on Hail Caesar! What ELSE Can I do with Leftover Turkey? Author WalkEatLivePosted on December 29, 2011 Categories Cooking, Healthy Eating, Holidays, RecipesTags Christmas, recipes, salad, turkeyLeave a comment on What ELSE Can I do with Leftover Turkey? Happy anniversary! Today we’re giving thanks and celebrating as we enter another year of marriage (31!). Breakfast is Grammy Hergett’s Sunshine Salad…to make it for two, cut the rind off a pink grapefruit and a couple of oranges, and dice the, bite-size. Sprinkle with a teaspoon of sugar or honey and some happy memories. Let stand for a few minutes so the flavours can marry. We added a few frozen strawberries from our summer’s effort, but usually we serve it simply. If you’re also celebrating a December anniversary, congratulations, and blessed be your union. Author WalkEatLivePosted on December 20, 2011 Categories Breakfast, Cooking, Food in a Hurry, Fruit, Gratitude, RelaxationTags breakfast, grapefruit, oranges, salad, winterLeave a comment on Spread a Little Sunshine!
. Don’t you love a meal that looks fussy, but isn’t? Tonight we made Beet Wellingtons (check our recipe page!) and a tasty salad with hothouse greens, tomatoes and mushrooms. For the dressing, we used some of the red pepper and rosemary pesto we made in the summer, thinned with some wine vinegar. Tasty, fast and packed with colours. Mmm. I'm Hot and Cold on this Lunch! On Wednesday we had a very interesting lunch. It started as a recipe from Cooking Light, except we didn’t use any of the same ingredients. Theirs called for Serrano Ham, Manchego, sourdough bread and arugula. Instead, our quick trip in the rain and wind to Plank Road yielded multigrain bread, prosciutto, and Crotonese cheese. All good, nonetheless. On the bottom, a piece of toasted multigrain was spread with grainy mustard and just a little mayo. On top of this, the ham, and a grating of cheese. 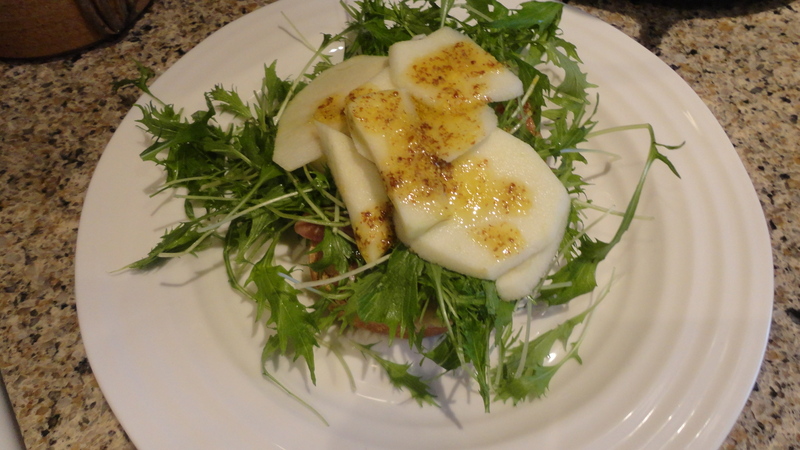 All that was heated under the broiler, then topped with some mizuna picked from our garden, a sliced apple, and a little grainy mustard vinaigrette (using Triple C from Kozlik’s). Author WalkEatLivePosted on October 28, 2011 Categories Cold Day Food, Food in a Hurry, Healthy Eating, Recipes, SaladTags bread, cheese, local food, neighbourhood, prosciutto, saladLeave a comment on I'm Hot and Cold on this Lunch!